Beeson Divinity School’s D.Min. serves to strengthen and encourage Christian ministers in the preaching of the gospel. The earnest desire of Ralph Waldo Beeson, founding benefactor of Beeson Divinity School, was to establish a school that would prepare “pastors who can preach.” At Beeson, the Doctor of Ministry in Christian Preaching serves to strengthen and encourage Christian ministers in the preaching of God’s Word. 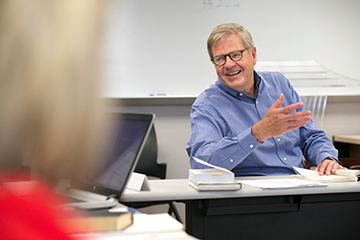 Students learn from Beeson faculty in a cohort of fellow preachers. The program is open to persons who have earned the Master of Divinity degree (or its educational equivalent), who have a minimum of three years’ experience in Christian ministry (post-M.Div. ), who are currently serving in a ministry role with regular preaching and teaching responsibilities, and who demonstrate the capacity for doctoral-level studies and the potential for excellence in the practice of ministry. Our aim is to sharpen preachers and to improve their preaching, to the glory of God and for the advancement of the gospel. Our students improve in their abilities both to interpret the Scriptures and to communicate its message with clarity and conviction; they grow in their knowledge and understanding of homiletical principles and practices; and they learn to integrate more fully personal, pastoral, and theological concerns in their preaching. A world-class faculty, such as Timothy George, Robert Smith, Jr., Frank Thielman, and Douglas Webster. While many schools draw largely from the ranks of adjunct professors to teach D.Min. courses, Beeson faculty members are the primary teachers of our curriculum. Outstanding resources for teaching and learning. From the holdings of Davis Library to the classrooms of Divinity Hall and the beautiful campus of Samford University, we are committed to providing the necessary resources and support for student success. Personal attention, because we believe that the very best theological training for ministry takes place face to face, life on life. For that reason, Beeson limits enrollment to each of its degree programs to cultivate an intensely personal learning environment with substantial student-faculty interaction. Affordable cost. The pursuit of a professional doctoral degree represents a significant investment of personal resources. We make every effort to provide quality education at a reasonable cost. Tuition and fees for the Beeson D.Min. program compare very favorably with our peer institutions. The Doctor of Ministry (D.Min.) degree requires the completion of 36 credits in varied phases of learning. Degree requirements include 5 weeks on campus for seminars, followed by the development and completion of a summative ministry research project. The degree can be completed in just over three years. Pursuit of the D.Min. degree culminates with a ministry research project, in which a student identifies a ministry problem or topic, conducts research related to that focus, develops resources and means to address the need, and evaluates the results. The student submits a written report and makes an oral presentation to the faculty for their evaluation. *Upon a student's notification of admission, a $200 enrollment confirmation deposit must be paid before the student can be registered for the first seminar. This deposit amount is deducted from the amount of the first term's tuition charge. **Doctor of Ministry students are responsible for paying the Campus Life fee and the Technology fee for fall and spring semesters only. Students are responsible for all expenses incurred for travel, lodging and meals, as well as for textbooks and other course materials. Student loans are available through the Samford University's Office of Financial Aid, but no scholarships are available. Beeson Divinity School admits new students to the D.Min. program once a year. The application deadline is February 1; new students attend their first seminar in the summer term of the same year. Personal interview with the Director of D.Min. Studies. The interview may be conducted by videoconference for persons who live a great distance from the school. To schedule an interview, please call (205)726-2374. Please schedule interviews several weeks prior to the application deadline. NOTE: Recommendation forms are automatically generated through the online application once required information is input. Applicants for whom English is not their first language and/or who completed their master’s degree in a language other than English must take the TOEFL (Test of English as a Foreign Language). A minimum score of 550 is required for admission. 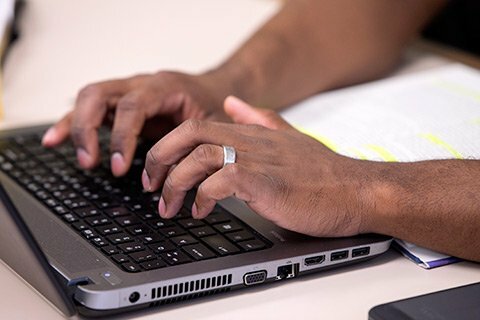 An applicant for admission to the Doctor of Ministry degree program will write a philosophy of ministry essay in which he or she identifies and discusses four (4) foundational principles for preaching and teaching the Scriptures. 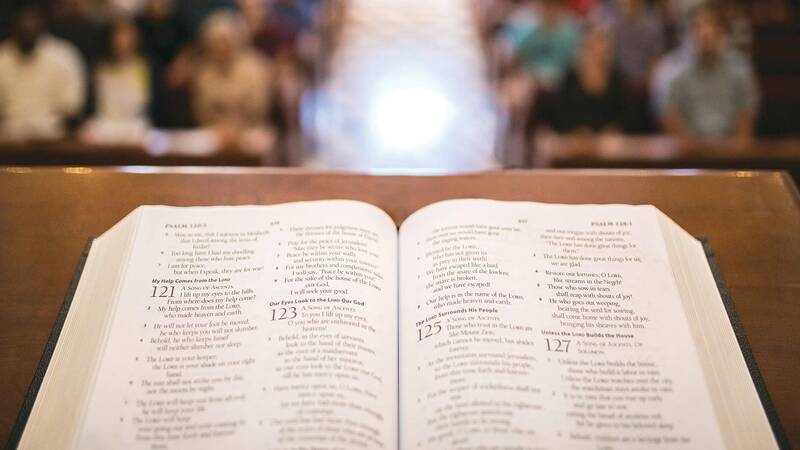 For each principle, the applicant must provide biblical-theological support, explain its importance or relevance to faithful proclamation, and give an example of how the principle finds expression in his or her ministry. The applicant must cite a minimum of 5 sources in footnoted references; the essay must also include a bibliography of all works cited. The essay must be paginated, and it should be written in conformity with Turabian style (Kate L. Turabian, A Manual for Writers, 8th ed. ).The essay should be 8-10 pages in length, double-spaced, in Times New Roman 12-font. As a university-based divinity school, Beeson offers students the opportunity to be involved in the larger community of a vibrant university. Divinity school students may fully participate in all Samford University activities including recreational facilities, concerts, theatrical productions, art exhibitions, lectures, recitals and sporting events. While students are on campus for seminars they have access to computer labs. The computer lab in the divinity school is open Monday–Friday, 8 a.m. until 4:30 p.m. Students in the D.Min. program may request that the lab stay open at other times also. The word processing program used in the divinity school computer lab is Microsoft Word on Windows XP. Other programs are available in other computer labs on campus. D.Min. students also have full access to the Samford University Library, which has more than 1,000,000 research aides, including bound journals, books, maps, CD-ROMs, videos, and audiotapes, with substantial holdings in religion. Students may check out materials from the University Library at any time, whether they are on or away from campus. A copy of every D.Min. dissertation published by Beeson students is held in the University Library. The D.Min. degree program requires that students attend seminars on the campus of Samford University for a total of 5 weeks during the program. Students are responsible for making arrangements for their housing while attending seminars and for the cost associated with that housing. On-campus housing is not available to D.Min. students. Students in need of assistance in making housing arrangements may contact the D.Min. Studies office at 205-726-2374. Samford University also provides a list of area hotels. Beeson Divinity School requires that all written assignments conform to the standards set forth in A Manual for Writers of Term Papers, Theses, and Dissertations (8th edition) by Kate L. Turabian.